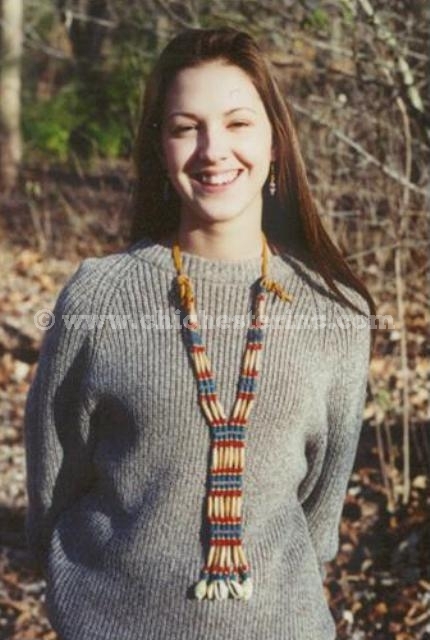 The Iroquois bone and horn jewelry listed below is made by Iroquois women on the Six Nations Reservation in Ontario, Canada. The colors vary, so please let us know if you have a color preference. We can let you know whether your choice is in stock. This traditional Iroquois bone jewelry is made with deerskin leather, cow bone hairpipe, brass and glass beads. This traditional Iroquois horn jewelry is made with black deerskin leather, buffalo horn hairpipe, brass and glass beads. 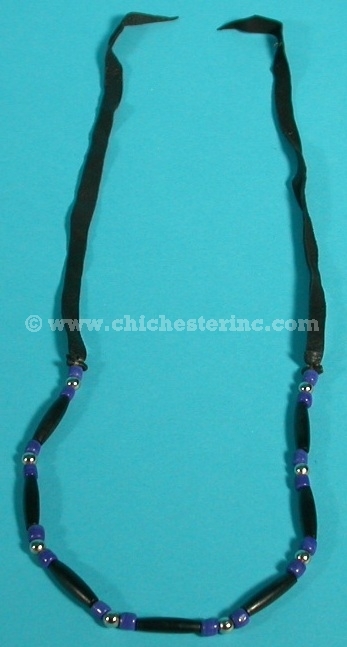 This traditional Iroquois choker is made by women on the Six Nations Reservation using cow bone hairpipe, cowrie shells, brass and glass beads. Modeled by Joy Brown. The length of the beaded necklace including the leather loops, but not including the leather straps, on either side is 13.5". Genus and species (yellow cowrie): Cypraea moneta. Wild. 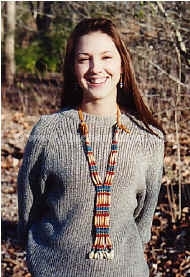 This traditional Iroquois necklace is made by women on the Six Nations Reservation using cow bone hairpipe, cowrie shells, brass and glass beads. Modeled by Joy Brown.